Lucerne is stunning. Absolutely stunning. So, is Lucerne Switzerland worth visiting? At the foothills of picture-perfect Mount Pilatus sits Switerzland’s vibrant lakeside city, Lucerne, which offers an ideal mix of city slicking and outdoor living. It’s one of those cities where, on clear cloudless days when Mount Pilatus shows you its full glory, you stop and sigh and wish you lived there. 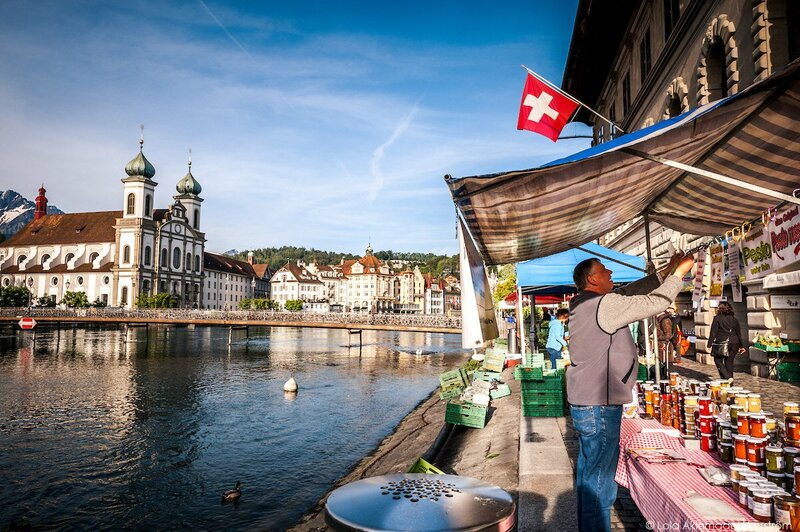 Life in Lucerne revolves around its proximity to water – from lakeside farmer’s markets and festivals to boat trips along Lake Lucerne with stunning views of Mount Pilatus in the distance. Wander the corners and nooks of its old town, enjoy a leisurely jog along its swan-lined waterfront, and peruse early morning Saturday markets for fresh produce and antiques. Lucerne feels like an elegant middle-aged lady. One wearing off-white pearls around her neck as she crouches on her knees in the dirt beneath a wide-brimmed hat, tending to her rose garden while wearing rubber gloves. Lucerne sits lakeside on a white wicker chair on lazy Sunday afternoons poring through romantic thrillers. This is after she has completed her morning Pilates session and has finally booked that trek to Kilimanjaro. Because Lucerne is worldly. She blends old money with new enterprise, wisdom with youthful exuberance, and yet, still feels very approachable and makes you feel at home. Of course, that’s the superficial city personality I would ascribe to Lucerne Switzerland and you can read how I describe other cities here. I was in Switzerland attending an intimate and exclusive travel writing conference called Travel Classics where about 40 travel writers get to meet one-on-one with editors of high profile magazines and publications to build contacts and share story ideas. In addition to Lucerne, I also got to explore both Bern – which happens to be Switzerland’s capital – and Basel which was a quirky little city with a lot of creative flair. I also summited Mount Pilatus (comfortably via cable car, not mountain-climbing!) as well as explored Lucerne’s corners and nooks, wandering through its old town, perusing its early morning Saturday markets, taking in some prime views from Art Deco Hotel Montana, and overall, soaking up Lucerne’s gentle vibe. The city sits on Lake Lucerne, the source of its name, and white swans glide elegantly across its warm green waters – colored from minerals in glacial runoffs. Across the Reuss River which feeds into the lake lies iconic 17th century wooden Chapel Bridge (Kapellbrücke) which was rebuilt after being destroyed by a fire in 1993. It is the oldest wooden covered truss bridge on the entire continent. I stayed a mere 10-minute walk from the waterfront and wooden bridge, which meant I always found myself gliding along the lake’s edge several times per day. I took a tour of its old stone city walls and towers to see the city from up high and to fully appreciate, by virtue of its geography, how beautiful it is. So, is Lucerne Switzerland worth visiting? Here are 50 visual reasons why I think you need to add this Swiss city to your travel plans and visit Lucerne. I am planning some family travel back to Switzerland in the near future and hope to explore more of Lucerne again. I highly recommend contemporary Hotel Astoria which is a 10-minute walk from the waterfront. Next time, I’ll probably try out Art Deco Hotel Montana. The views from that hotel across the lake with stand-on views of Mount Pilatus is everything. Want to see more Lucerne photos? View more photos from Lucerne in my image bank. 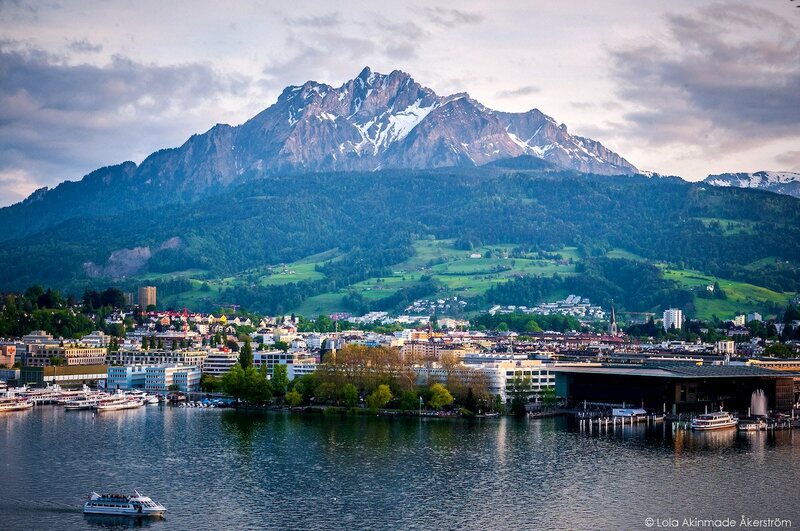 Have you been to Lucerne in Switzerland before? What did you think? Do you agree with me?